Or, "How the Devil Pays"
The Financial Times has featured an editorial penned by Council on Foreign Relations president Richard Haas titled, "Libya Now Needs Boots on the Ground," where the arch globalist states that Libya's rebels are in no way capable of rebuilding Libya properly and will require an "international force" to maintain order. Haas breathtakingly admits that the NATO intervention to "protect civilians" was in fact a political intervention designed to bring about regime change. With NATO leading the offensive against Tripoli, a relatively calm city until now, the alleged cause of "protecting civilians" rings hollower than ever. Photo: One of the founding fathers of Al Qaeda, Robert Gates (left) and CFR president Richard Haas (right). Haas goes on to explain that NATO's "success" is what requires this international assistance in the predictable form of an occupation force to deal with looting, "die-hard regime supporters," and tribal war. Haas also implores Obama to reconsider his decision to rule out American boots on the ground and to do so quickly. Of course, NATO didn't just spend the last 5 months conducting 7,000+ airstrikes on Libya to "protect civilians" and then ride off into the sunset. This was a war of conquest from the very beginning, with globalists openly declaring it would determine the "primacy of international law" over the nation-state. In fact, the initial uprising itself was gestated in Washington and London where opposition leaders were provided resources and safe-havens to conduct their sedition, with globalist stooges like Ibrahim Sahad literally sitting in front of the White House calling for NATO to bomb his homeland. NATO, its members, particularly the US, UK, and France, and the globalist corporate-financiers behind them, fully intend to rebuild Libya according to their own aspirations shoehorned into a national consensus imposed upon the Libyan people under the guise of "democracy" and "civil society." We are watching a modern empire expand its boundaries into yet another sovereign nation. Readers may remember an April 2011 article titled "Libyan Rebels Fighting the Globalists' War" with the ever increasingly appropriate subtitle, "How the Devil Pays." In it a caption attempts to sum up Libya's future by stating, "if these rebels really think the West is going to hand them Libya and its riches, they have another thing coming. The Neo-Con arm of the globalist agenda is already seeding the ground to deal with "extremists" coming to power after the "Arab Spring" runs its course. That means Libya's oil & future will be left in the hands of NATO troops, not the Libyan people." "While the dichotomy of Western politics is merely for public consumption, what each camp states publicly can be put together as a composite giving us a clearer picture of the overall globalist agenda. Neo-Conservative war monger Daniel Pipes, a PNAC signatory, CFR member, and co-conspirator in many of the darkest chapters of recent American history, was recently sharing his "doubts" over the final result of the "Arab Spring." He believes that ultimately extremists will prevail in many cases and only complicate US relations with certain countries. Of course, Pipes most likely didn't miss the memo and is fully aware that the "Arab Spring" is a US funded gambit, one his fellow "Neo-Cons" lining the National Endowment for Democracy and the fraudulent Freedom House are admittedly involved in. At the very least, he must have picked up the New York Times and read as much. So what exactly is Pipes trying to tell us? 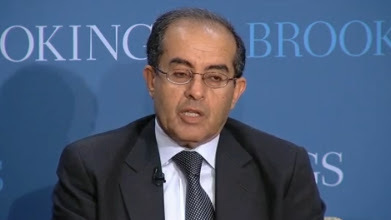 He is saying that as soon as the Libyan rebels secure Libya, or the Muslim Brotherhood takes hold of Syria, or Yemen, or wins out in a co-opted counterrevolution against International Crisis Group stooge Mohamed ElBaradei in Egypt, the blinders Western propagandists seem to be wearing will suddenly drop and point out that indeed the globalists have installed extremists "by accident." To rectify this, Libyan rebels will be betrayed just as quickly as Qaddafi was. They will be removed from power, and replaced by Western stooges protected by NATO ground troops, conveniently already being put on the ground in Libya, and will stay there permanently. 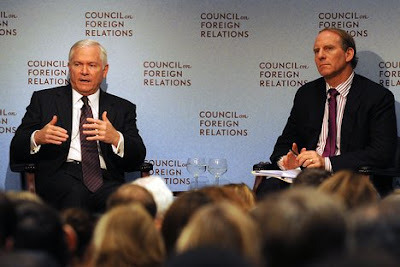 The globalist "Neo-Con" think tank Foreign Policy Initiative has stated, "The best way to reduce the potential dangers posed by extremist infiltration is for the United States and its allies to remain engaged in Libya." This engagement most likely will take the shape of the other unending "engagements" in Iraq and Afghanistan, and the years of cross-border raids into Pakistan. The oil money that once built water ways, public housing, and farms from Benghazi to Tripoli, will be funneled directly out of the country and into the corporate-financier's accounts. The corporate-financier oligarchs will have taken yet another nation-state down with the help of its own gullible population, and for their gullibility, they will pay for the rest of their lives, as will their children and their children's children. To understand the full scope of the global corporate-financier oligarchy's designs toward any given nation, we must simply look back at the brazen admissions made over the intended future stemming from the outright military conquest of Iraq and Paul Bremer's (CFR) planned economic reformation of the broken nation. The Economist enumerates the "economic liberalization" of Iraq in a piece titled "Let's all go to the yard sale: If it all works out, Iraq will be a capitalist's dream:"
Anyone who would willfully make a deal with such people must have their discernment called into question. As Hugo Chavez of Venezuela said of Hosni Mubarak's decades of appeasing the globalists and his eventual ousting from power at the hands of US funded, trained, and supported protesters, "that's how the devil pays." Indeed it is, and it is an instructive lesson for others including the rebels of Benghazi to consider as they attempt to make their own deals with the globalists today." And indeed, as NATO rushes through to the finish line with a spectacular display of mass-murder and mayhem in Libya, and with the rebels dancing in the streets as NATO warplanes roar overhead, the time is soon approaching for Benghazi to pay back the West for their "help." Photo: Libyan rebel leader Gibril Elqarfally stands before the Fortune 500-funded Brookings Institution openly declaring fealty to the globalist agenda of interdependency and subservience to a Wall Street-London international order. When asked by an audience member what Libya will look like in 2025, it turns out conveniently he was part of a study by Libyan professors and “Libyan practitioners” in 2007-2008 titled “Libya: Vision 2025.” Not surprisingly, this project was conducted with input from the IMF and involved Libya’s placement within the “global scene.” Elwarfally laments that Libya’s oil reserves are limited and that the solution is a transition to a service economy. He also claims Vision 2025′s conclusion included an education shift, turning Libya into “a lake” to develop the skills of Africans to serve the needs of the European Union. While Qaddafi's comments are dismissed out of hand, a recent message sent to his followers amidst fighting in Tripoli declared, "the traitors are paving the way for the occupation forces to be deployed in Tripoli." It seems no truer words have ever been spoken and the Libyan people, including the rebels, will have no one but themselves to blame if they allow such a way to be paved.